One of my favorite DIY blogs is Marie Rayma’s blog Humblebee & Me. She has a beautiful approach to DIY, creating products for herself and her friends for the joy of it, and never selling. Because she does not sell, she can also go into discussions of the healing benefits of certain products, and she tends to provide recipes that make a reasonable amount of product (for example, five tubes of lip balm instead of fifty). She recently posted a recipe for a facial oil serum based on mixing her favorite, argan oil, with evening primrose oil to help heal and prevent hormonal acne. Now, I’d looked at evening primrose oil for that same reason, although I don’t use argan oil. I decided to try blending it with my preferred oil: rose hip. 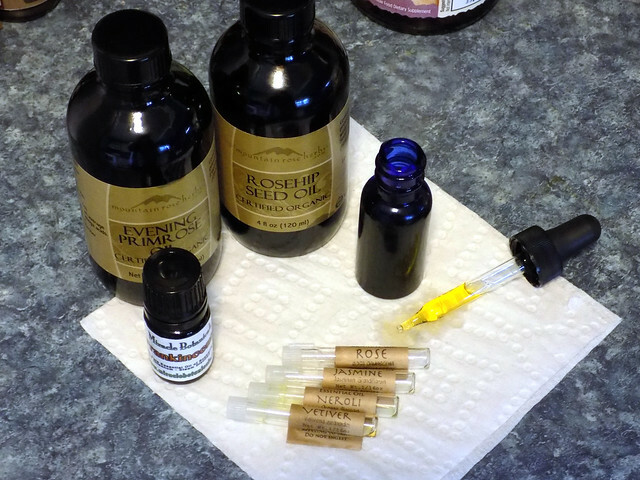 I finally got my order of fresh rose hip oil and a bottle of evening primrose from Mountain Rose Herbs and have been using my oil blend of fifty-fifty rose hip to evening primrose for a few weeks now. It is a heavier oil than rose hip alone and took some getting used to. It also has a bit of a deep-fryer scent to it. To remedy that, I decided to add some skin-regenerating essential oils, inspired by True Nature Botanicals Face Oil. Now, I love the scent of their oil, but the particular blend skews higher in oleic acid than I like. The oil itself is quite dear, but the ingredients are not a whole lot cheaper than the finished oil itself. That said, the formula is not what I would consider ideal. So I found an Etsy seller who would sell me small amounts of precious floral oils. I blended 1/16th of an ounce each of jasmine, rose, vetiver, and neroli essential oils, along with ten drops of frankincense essential oil into my bottle of rose hip oil, which had about 3.5 oz. left in it. This I mixed well, and then blended half and half with evening primrose oil. It works out to about a 3% dilution of the essential oils. It has a light fragrance and just covers the oily scent of the oils itself, plus the essential oils are known for being good for healing skin and helping it retain moisture. I’ve been using the oil for the last several days in the evening, and it is a lovely experience for all my senses, I think having a lovely-smelling facial oil prompts me to take a bit more time massaging my face in the evenings. And I don’t smell quite so much like a fast food restaurant when I go to bed!